1. Planning a trip to Univerity of Aizu" PDF "
2. Travel by Bullet trains (Please carry these notes) " PDF "
Train Time Tables " Aizu-Koriyama-Tokyo"
3. University Map of Facilities " PDF "
The workshop has published its proceedings in the Springer in the Lecture Notes in Computer Science (LNCS) series. Please complete the registration form and send it by Email / FAX with workshop fee details. FAX number is - +81 ( 242 ) 37 - 2753. Registration Form " Text File "
The workshop will take place at University of Aizu. The University of Aizu is in the scenic vicinity of the Bandai-Asahi National Park, and is located in Aizu-Wakamatsu City, the historical capital of the Aizu region of Fukushima Prefecture. It is famous for Tsurugajo Castle, museums, hot-spring and skiing resorts and sake (Japanese rice wine). It is about three hours from Tokyo by train (for travel). Western Style Hotel, which rates from about 6500JPY (single) to 13000JPY (twin) per night and Japanese Style Hotel (Ryokan) with Hot Spring, which rates from 10000JPY (two persons/one Japanese style room, with breakfast) to 17000JPY (two persons/one room, with breakfast and dinner) per night are available in the near vicinity. Sightseeing buses leave regularly from the station. 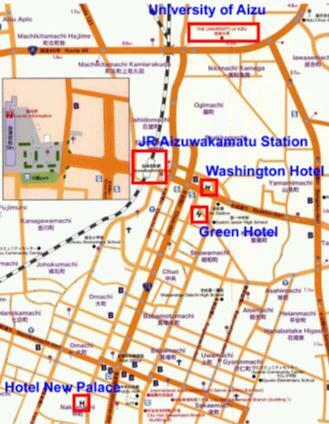 You need to take a conference pickup bus (from Washington Hotel), or local bus to the Unversity of Aizu, or take a taxi. It costs 160JPY by bus, and about 1,000JPY by taxi. 15-minite walk from Aizuwakamatsu Station. 30-second walk from Aizu-Wakamatsu Station. It takes about five minutes by car from Aizuwakamatsu Station. Located high in Aizu Higashiyama Onsen hot spring resort, overlooking the town. Direct any questions to one of the organizers, or to the workshop email address: <DNIS2014@u-aizu.ac.jp>.